Like many, many others, I am feeling deeply ashamed of Australia as a nation. Our political leadership is utterly bankrupt, bereft of any integrity it ever had. But it is not all bad news. Yes, we pursue breathtakingly cruel policies towards First Nations peoples and asylum seekers and people with disabilities and anyone other than the demographic elites who fund and run the political class. Our record on environmental destruction, from carbon emissions per capita to species extinction to digging up and shipping out the most dangerous substances on earth, is second only to the gross violence and greed of past and present imperial powers. Here in sunny, safe, wealthy Australia, we actively exacerbate the two greatest disasters of our time. These are the 60 million displaced people in the world – and many more living under violent attack, including by us. At the same time, we continue (or fail to halt) wanton destruction of the planet, up to and including climate crises. This mess is a man-made mess; and a mess that can be laid squarely at the feet of what is – ridiculously – called western civilisation. Across the globe and across recent centuries, those who have failed so dismally at global leadership continue to loudly lay claim to an inherent capacity to run the planet. Western civilisation, for all its glorious achievements in the arts and sciences, in fine music and soaring buildings and miraculous technology, is a grinding force of violent destruction, driven on and on in grim and greedy pursuits by political leaders, the wealthy, the military-industrial complex, wars and proxy wars, and any and all of us who conform and comply rather than stand against the tiny, privileged minority. Much of this is known and accepted, including in the west itself; and as a white woman in a developed nation, I can only speak from the western tradition. I have just returned from field work in the north west of New South Wales, or what is properly called the Gamilaraay and Gomerroi nations. One research site was the Liverpool Plains, where their Harvest Festival was timed to coincide with a protest against five proposed, and enormous, new coal mines, to be operationalised by the monstrous Shenhua Watermark Coal Pty Ltd.
One of the most striking patterns to emerge from speaking with those campaigning against these open cut mines was a massive sense of betrayal: betrayal by government, betrayal of the people. Traditional owners, and there was a significant contingent of Gamilaraay and Gomerroi people, seemed to expect no more (or no less) than to be betrayed and exploited and lied to and violated and harmed by government – and the rest of us – time and time again. Yet members of the mainstream white communities seemed to be reeling in disbelief that government is not, in fact, governing in their interests. Governments which identify as democratic have never governed in the interests of all the people within their jurisdiction. This much is obvious to many, but not nevessarily to agricultural communities whose farms are now under threat. The main site of betrayal here is that mining approvals are either granted or not stopped by current Coalition governments in New South Wales and the Commonwealth. One source of that sense of betrayal, therefore, is that the Coalition includes the National Party, for whom most of this demographic have voted all their adult lives. One very powerful lesson was delivered at Harvest Festival by former-National-turned-independent, Tony Windsor. 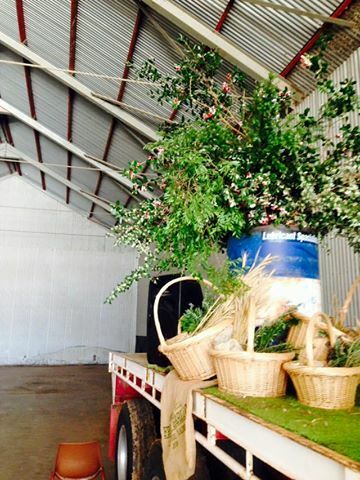 On a flat bed trailer stage he shared with Gamilaraay-Gomerroi woman Dolly Talbot, Jane Delaney-John from Red Chief LALC, Fiona Simson of National Farmers Federation and Greens MP Jeremy Buckingham – flanked by 44-gallon drum vases of stunning local flora – Windsor spoke clearly to the failures of the political class. Windsor urged the crowd to understand that it is the people who must stop these mines, as we can not rely on politicians to do so. The way Tony Windsor spoke to people power articulated a deep and wide democratic deficit, a huge gap between what the people are saying and what governments are doing. What politicians are saying is a third force in this system; and an important one, because democratic deficits are nothing new. The very long list of people disenfranchised by the dominant hegemonic elite, in democracies so-called, goes back centuries. This disenfranchisement extends to colonised First Nations peoples, slaves, women, non-real property owning men, many people with a disability, stateless persons, and all young people below the age of majority. Of those groups on the list who now have at least the legal right to vote, none were granted this most fundamental democratic right in return for asking nicely. From the English royalists of the seventeenth century to the ruling classes of the twentieth, those who have the vote have always pushed back, hard, against extending this right to those who did not. The method of push-back, both then and now, is state-sanctioned and state-funded armed violence. That is, police and others who are armed and trained by government (taxpayers) are deployed to violently suppress citizens in a democracy. In the case of universal suffrage, this is violent resistance by the state to the most basic of power-sharing arrangements: voting rights, in a democracy. It is from this history that we can glean the critical role of what politicians say when examining democratic deficits (as opposed to what the people are saying and what the politicans are doing). And because we are looking at what politicians are saying, it is necessary to include the various media by which politicians’ claims are communicated, the ways in which politicians’ messages are shaped and framed and distributed, and the extent to which politicians are believed and trusted by the electorate. At the heart of liberalism, from its earliest days, is a lie: the mythology of meritocracy. Every liberal instuitution remains dominated by white men to this day. This is exactly how liberalism has always been. We can see this operating against the people of the Liverpool Plains on Gamilaraay-Gomerroi country. 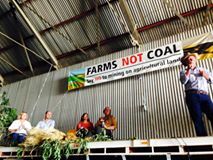 Back at Ridge Station, Breeza – the base camp of the 2015 Harvest Festival and protest against proposed Shenhua Watermark coal mines – Windsor was the highest profile political speaker, though he has of course retired from politics. Jeremy Buckingham is also widely known, at least in environmental-protest communitities. One current federal politician showed up: Jacqui Lambie, an independent senator from Tasmania. The messages from Dolly and Jane and Jeremy and Tony and Jacqui were unequivocal, and as one: these mines must not go ahead. In contrast, the politicians who in fact hold general and specific powers to stop open cut mines from going ahead on the rich and fertile lands of the Gamilaraay and Gomerroi are speaking a different language. The central figures here are the NSW Premier, Mike Baird, and his planning minister, Rob Stokes. Their federal counterparts are the Prime Minister, Malcolm Turnbull, and his environment minister, Greg Hunt. Again, this reflects the history, the context, the prototype of democracy, as established by propertied white men, for propertied white men. It is not always obvious that that these four people (Turnbull, Hunt, Baird, and Stokes) all belong to the exact same demographic. This is for the same reasons – the normalisation and invisibility of white patriarchy – that many of us remain misled and misguided (ie indoctrinated and lied to) on just how undemocratic are the liberal democracies. Unlike on that flat bed truck in a Breeza farm machinery shed, there are no women among the LNP leadership who could stop these mines. There are no First Nations people, no young people, no-one who rejects neoliberalism or capitalism. Yet the destruction of the planet on which we all depend to survive can not be traced to the cultures and practices of Indigenous peoples, or what mothers do, or how children and young people behave. No. It is not difficult to identify when decision-making power is concentrated with a tiny minority, a group sufficiently powerful and wealthy and privileged to quarantine themselves from the harms they cause. The historical record tells us that the liberal democracies have traditionally been run by a powerful and unrepresentative minority who act in their own interests, to the detriment of everyone who is not a member of their group. The foundations of these structures can again be traced to the seventeenth century struggle in England between the monarch and the parliamentarians (white, power-seeking men all). To return to the historic context is important, because ahistorical decontextualisation is a common strategy of the dominant hegemony (this is just a fancy way of saying that history is written by the ‘winners’). During the English civil war, large groups of armed men killed each other, and women and children – who always suffer the most in such conflicts – over whether an extremely powerful individual or an extremely powerful group of individuals should be recognised as having the legitimate (lawful) authority to rule over everyone else. It is this person or these persons who claim to legitimately hold lawful power to make decisions about how others can and should live. In contemporary Australian politics, as with other liberal democracies, members of political parties do the same thing. The Lab/Lib/Nat members and their supporters are like the Royalists, or roundheads. Each is ideologically driven, and seeks to hold power, within the existing power structures, over the rest of the polity. These groups are not uninfluenced by the electorate (the ‘people’ part of the polity), but their main channel of influence-advice is via yet more status quo: wealthy, influential pollsters. Each major poll is linked to a major media outlet, and each major media outlet is linked to a proprietor. It doesn’t matter what individual reporters or journalists or opinion writers say – wherever their writing appears in the mainstream media, it is framed by the politics of the proprietor, his networks, the chief editor or other executive, his networks, and so on down the hierarchy (and for an excellent analysis of what polls are to democracy; which is a bit like what meritocracy is to liberalism, see http://www.newyorker.com/magazine/2015/11/16/politics-and-the-new-machine). This is not to ignore the amazing work of the many people and new media operating despite the dominant hegemony. It is merely to describe old media and its enduring and daily influence on the electorate. The point of unpacking this cultural hegemony is in turn to point to various sides of society in terms of democratic surplus and deficit. The one percent, as the highest-ranks of elites are commonly called – our current Prime Minister belongs to this group, with his estimated $200 million wealth and position at the head of the Cabinet table – can afford to opt out of democracy altogether. The influence of a James Packer or Twiggy Forrest is wielded not via the ballot box but through direct channels to the minister’s office. These men do not send their children to public schools. While everyone benefits from public health services such as ambulances and the big teaching hospitals, only the wealthy can afford to opt in to the most luxurious of private hospitals. It is the operation of these forces – money, power, and control of the narrative that falsely justifies who has how much of each and why (the mythology of meritocracy) – that has brought the world to the brink today. Since at least the 1830s, the environmental destruction that is caused wherever surplus is pursued has been known, recognised and understood by members of the very societies, cultural traditions and communities who are responsible for such destruction. These societies and cultural traditions are defined by the use of unrestrained armed violence, as exercised by the empires and colonisers of western Europe and England in particular. The purpose of deploying large numbers of armed men beyond the fledgling nation state was to secure access to, and power over, peoples, their territory, and its natural resources. Which brings us to the slightly less grim chapter in this story, a tale of 21st century Australia. We are a vast island surrounded by many smaller ones, remote from much of the world, and buffered from much of the world’s troubles by huge oceans and, for upwards of 40,000 years, the wealth that stems from once-carefully managed natural abundance. It is worth noting that while all wealth can ultimately be traced to natural resources, the line is very direct in Australia. From the sheep’s back to the gold rushes to the resources and mineral booms, we white Australians actually teach our children that this huge Australian wealth is luck and the ‘hard work’ of settler-colonials. In fact, of course, Australian wealth is directly traceable to the past and continuing dispossession of Indigenous people. Whether wool or gold or iron ore, Australian wealth comes directly from the land. The Australian earth, its rivers and plains, have been trashed since 1788, just as the settler-colonials attempted to destroy the people themselves, the people who had taken such care in custodianship of the land for so many millennia. And here is the heart of the matter. The settler-colonial state has failed. It has failed to destroy that which it set out to destroy (while claiming that any ensuing destruction would be “inevitable”). The settler-colonial state has failed to be a better land and water manager than traditional owners, failed as a natural resources manager, and failed to create a better human society – in terms of equality and justice in the social sphere. – Blackburn J, Milirrpum v Nabalco Pty Ltd, (1971) 17 FLR 141 (the “Gove land rights case”) describing the testimony of Yolgnu traditional owners in an early land rights case. And here is the beautiful thing. At the risk of sounding starry-eyed, this continent and her islands endure. Step back, take a look at a world map. In the old days, medieval scholars up in Europe thought we anchored the Southern hemisphere, the planet itself. And leaving aside northern/southern constructions, we do. There is no land mass more remote from other continents on earth than what is now called Australia. There is no bigger island, inhabited and inhabitable, anywhere in the known universe. We humans build alliances, we find common ground. We are dangerous and cause high impacts, yet I think the subtle and stronger influence comes from traditional owners and, axiomatically, from the land itself. Deep down, every Australian knows that this place is magnificent, bountiful and beautiful. Deep down, every non-Aboriginal Australian knows that this truth is inextricable from another truth: the original and deepest connection to the land – no matter what white law or society or history says – belongs to First Peoples, Aboriginal and Torres Strait Islanders, Indigenous nations, language groups, clans. It is the land that unites us. It is the land that brought farmers to sit with traditional owners, and ecologists, and activists. First peoples, Aboriginal and Torres Strait Islanders, have known this land for millennia. The call from Tony Windsor was that this fight – to stop five open cut coal mines – must be led by traditional owners. I agree. Tony Windsor speaks a truth, and I look up to him for that. At the same time, I’d say that we white people are not too great at this. Our track record is rubbish. White Australians are generally racist, we actively endorse human rights violations, and are hopeless at defending Aboriginal rights (be it property rights or human rights – as the white law divides the land from its people). As Dolly Talbot said at the Gamilaraay Gomerroi yarning circle, you open the door to us now. Do not close the door when this fight has been won. Black belonging to land can not be negated or nullified or wiped away by any form of white law, no matter which way the white law exerts itself. This is not to underestimate the force with which those who make and exert white laws – the Turnbulls and Hunts, the Bairds and the Stokes – will exercise their governing authority, their ‘lawful power’ over how others may live. Recall that this is in fact the protoypical model of democracy – forcefully imposing laws that are bad for the majority of the people, and bad for the land, is what politcians do, but not what they say they are doing. Some of the good news can be attributed to the democratising force of social media. Very few citizens have the luxury and privilege of political participation (this is called apathy, or disengagement, by those who do). Many of us are too busy looking after our own and our families’ survival. But very many citizens have a smart phone and a social media account. Betrayal of the governed by the government is not new to most. In Breeza, those who are experiencing an awakening turned around and found that there are highly skilled, politically engaged, deeply knowledgeable groups of people already standing up. The farmers have joined the traditional owners, ecologists, environmental activists – to stand against government which does not govern in the interests of the land, and therefore does not govern in the interests of the people.